Sen. Laurie Monnes Anderson's biggest piece of advice for seniors in East Multnomah County is to be flexible with life plans and able to adjust to unexpected challenges, as it can be hard enough to plan for retirement — even when things go exactly as planned. Monnes Anderson had to deal with adversity when her husband was diagnosed with bipolar disorder after they had been married for eight years. At the time the medical community did not know much about mental health or the best way to proceed. "I did the best I could — made decisions, right or wrong," Monnes Anderson said. "Most of us can overcome diversity no matter how it rears its head in our lives." 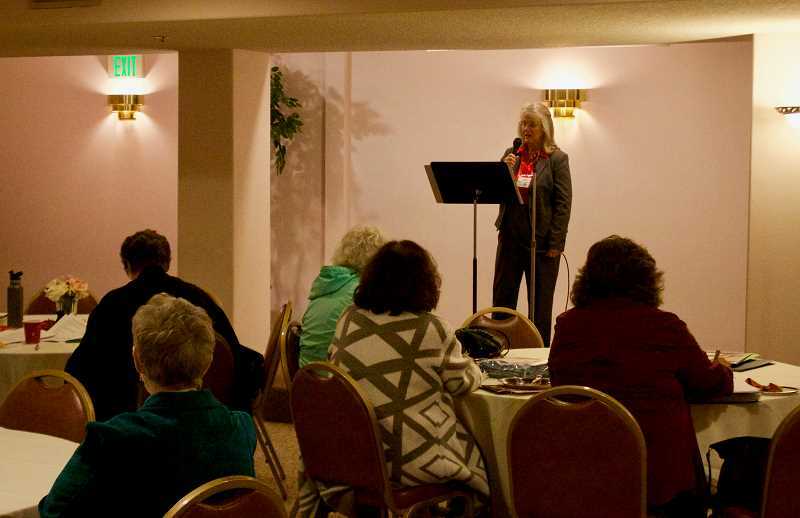 The senator spoke about seniors in the region and the issues they face during a talk hosted by the Gresham branch of the American Association of University Women (AAUW) on Monday evening, Oct. 22, at the Gresham Memorial Chapel and Event Center, 257 S.E. Roberts Ave. The senior population across the region is growing. In Multnomah County, the population has grown by 9 percent since 2010, which is dwarfed by the 35 percent growth of seniors in the same time frame. In East Multnomah County, 25 percent of residents are older than 55, Monnes Anderson noted. The Gresham area also has the highest concentration of people with disabilities between the ages of 65 and 74 in the country, and second highest in the 75-and-older population. "It's important to think about what is happening and get involved," she said. Seniors need the support of communities and families to thrive, though Monnes Anderson said it's time to expand how we think of those groups of support. Rather than limiting it to direct family members, she said instead entire neighborhoods should band together to help. In Portland a new program called Villages NW features a group of neighbors supporting one another. The focus is on doing small things for elder members of the community, like going for coffee, dining out, small chores and general assistance. The idea is to allow seniors to age comfortably in their own homes, while maintaining a level of assistance needed. "That concept of a network of neighbors could work in our community," Monnes Anderson said. "We need to start thinking outside the box." It is getting expensive in Oregon for people to move into assisted living facilities, senior homes, receive home visits, hospices and other forms of places for seniors — especially if they don't qualify for Medicaid. "Retirement planning is extremely important," Monnes Anderson said. "Younger generations need to focus on that." Seniors are also facing elder abuse, something that the senator has many constituents calling about. The abuse isn't just physical harm. It includes failing to provide basic care, abandonment or involuntary seclusion, unwanted sexual contact, verbal or emotional abuse, neglect, wrongful restraint and financial exploitation. The key is to have people report whenever there is a possibility of abuse occurring. Recent enactments in the Oregon Legislature has improved the quality of care and have set some of the highest standards in the country for assisted living facilities. House Bill 3359 and 4129 both added high fines for elder abuse and failing to report, created supervision programs, grading for care facilities, better training for providers, licensing requirements and much more. There are also stricter standards for home-care providers, with training and better culturally appropriate care to account for the growing diversity in the state. "It's going to take a lot of work to make sure we are reaching our goals," Monnes Anderson said. The passing of Senate Bill 95 allowed for better reporting of financial exploitations. Monnes Anderson had two constituents who were taking advantage of their parents through their access to their savings, draining them of funds. Now, with the new bill, financial advisors are mandatory reporters for any suspected abuse, and can even delay distribution of funds until things are investigated. "We need to have intergenerational coalitions and develop agendas that bridge the gap so we are all working together to support seniors," Monnes Anderson said. The AAUW advances equity for women and girls through advocacy, education, philanthropy and research. The local branch, established in 1971, has more than 65 members working to provide programs on women's and girls' issues, community projects and women's outreach activities. They give an annual $2,000 tuition-assistance scholarship to Mt. Hood Community College, and a trip for college sophomores and juniors to attend the National Conference of Women Students Leaders at the University of Maryland.